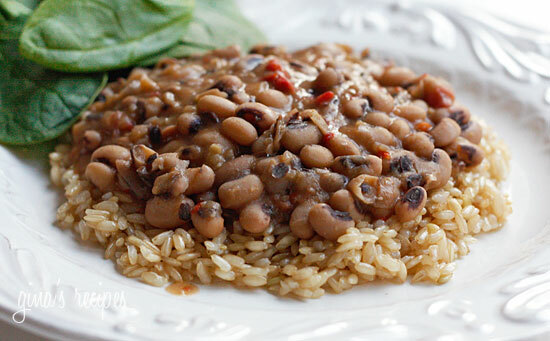 Low fat southern style black eye peas with ham, made in your crock pot! It’s really a bean rather than a pea, and an excellent source of calcium, folate, vitamin A and fiber. A perfect recipe for that leftover ham bone, but a ham steak would work great too. These have a mildly spicy flavor, you can adjust the heat to your taste. I served this over brown rice but this would also be great to eat as a soup. I get a lot of requests for crock pot recipes, so I decided to experiment with dry beans in my slow cooker. I was prepared to call it a loss if they didn’t turn out good. Boy was I was pleasantly surprised! The beans cooked to perfection and this couldn’t be easier. I’m excited to make some of my other dry bean recipes in the crock pot now that I know how good they came out. Crock pot recipes tend to need more seasoning, I found seasoning the beans the last hour of cooking allowed for maximum flavor. Soak peas overnight in 6 cups of water. The next morning, drain peas and add to slow cooker. Add 4 cups of water, bay leaves and ham. Cover and cook on high 6 hours or until the beans are tender. After 6 hours, in a large frying pan, add oil and sauté onion, garlic, bell pepper, jalapeño pepper, and tomato until soft, about 6 minutes. 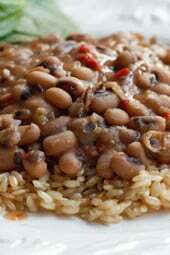 Add to the slow cooker and season black eyed peas generously with salt, cumin, chili powder and black pepper. Cover and cook on high 1 to 1 1/2 more hours.